It represents relation between torque and armature current in the DC motor. It is known as electrical characteristic of the DC motor. It represents relation between speed and armature current in the DC motor. It is known as mechanical characteristic of the DC motor. 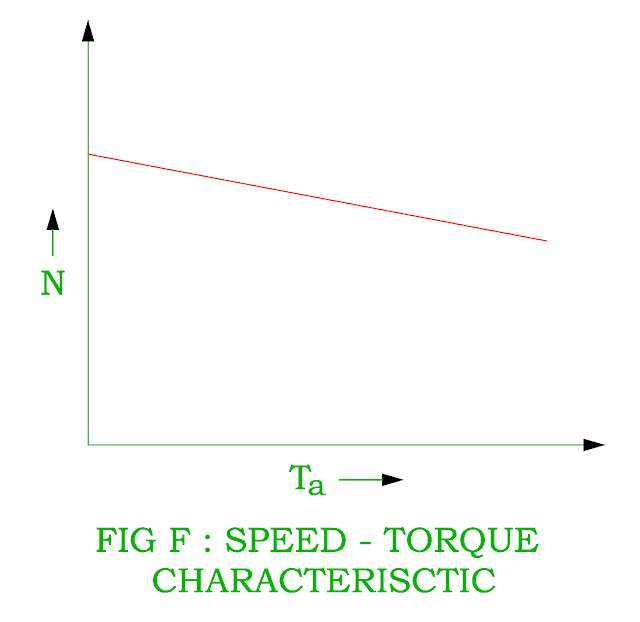 It represents relation between speed and armature torque. It is known as mechanical characteristic of the DC motor. 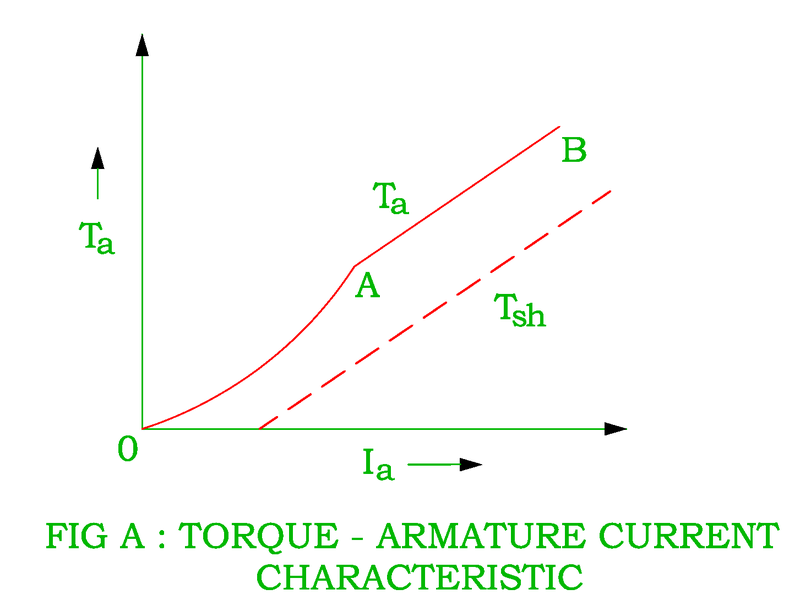 The armature torque is directly proportional to the product of flux per pole and armature current. The flux is directly proportional to armature current before saturation of poles therefore flux is directly proportional to armature current. The torque is directly proportional to square of the armature current at very light load therefore the torque – armature current curve is parabola upto point A as shown in the Figure A. The flux independent of armature current after saturation of poles therefore the armature torque is directly proportional to armature current. Hence the characteristic is straight line from point A to point B. 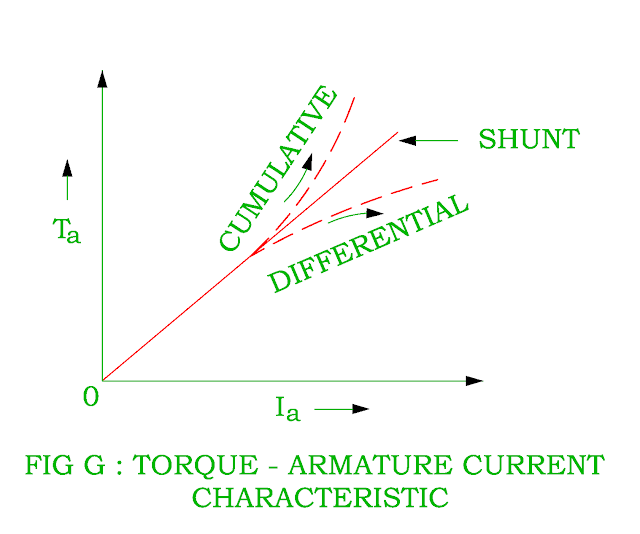 The shaft torque always less than the armature torque due to stray load losses. The series motors are used where large starting torque requires. i.e. Electrical trains, electrical vehicles, trolley etc. The speed is directly proportional to back emf and inversely proportional to flux in the DC motor. The change in back emf is very small due to small voltage drop in the armature and series field resistance therefore the speed is inversely proportional to flux as constant supply voltage. 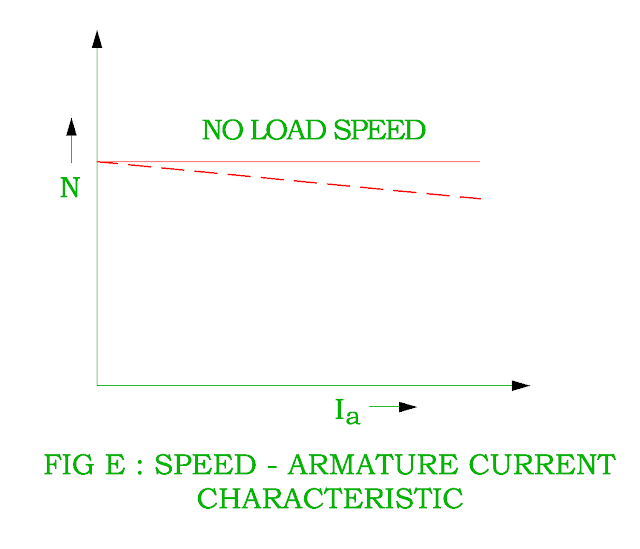 The armature current is large at heavy load condition. This will result in increase of field flux and reduces the speed ( as a result back emf decreases and more armature current allow to flow ). Why the DC Series Motor never start at no load? Therefore the speed continues to increase until the armature gets damaged due to heavy centrifugal forces. That’s why the DC Series motor is never started at no load. The DC Series motor is variable speed motor as shown in the Figure B. 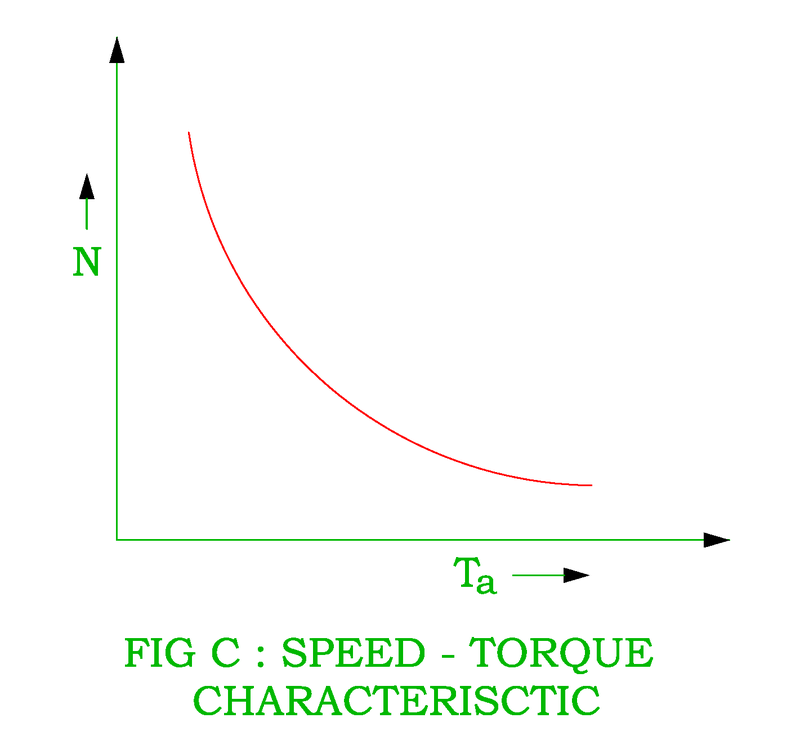 When speed is high, armature torque is low and vice versa. 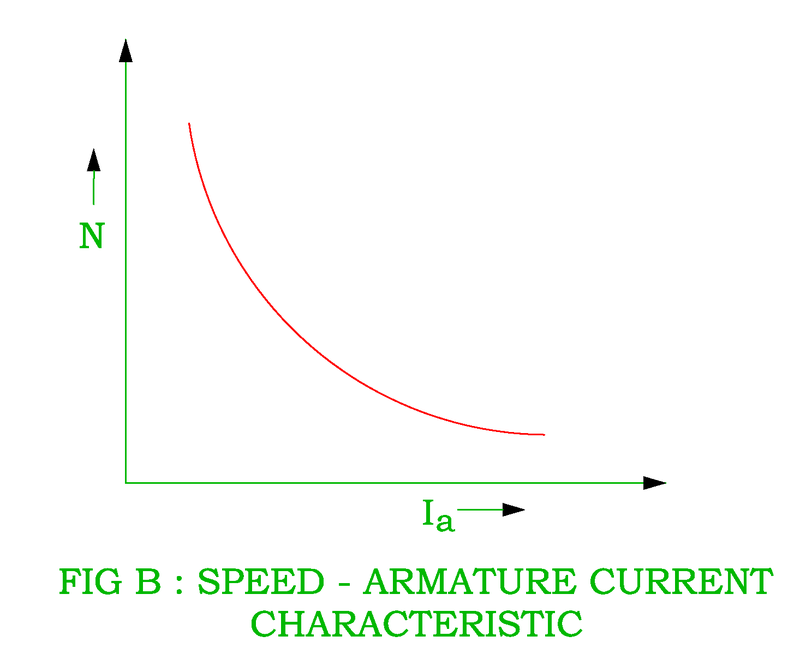 The relation between speed and armature torque is shown in the Figure C.
If the supply voltage is kept constant, the field flux remains constant. 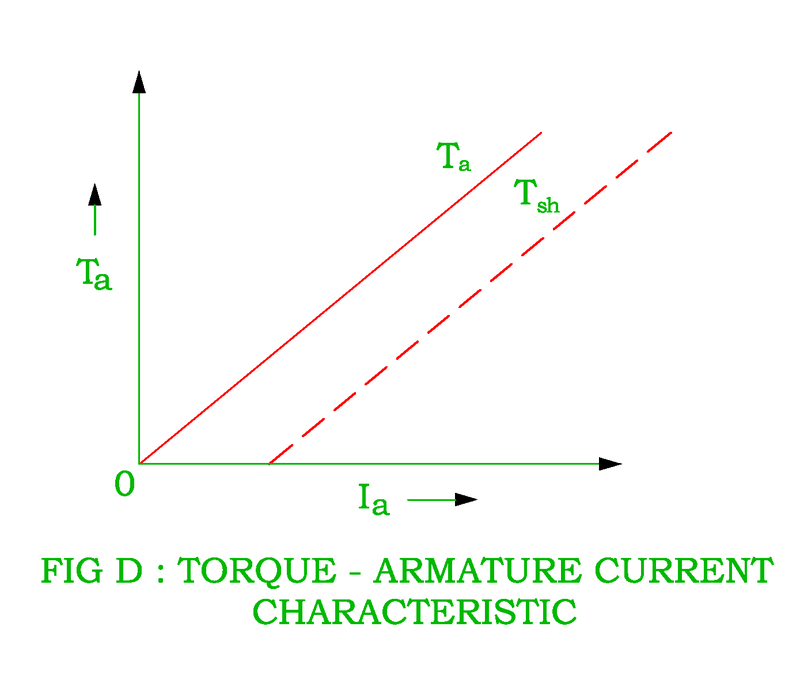 The characteristic of torque – armature current is straight line from the origin. 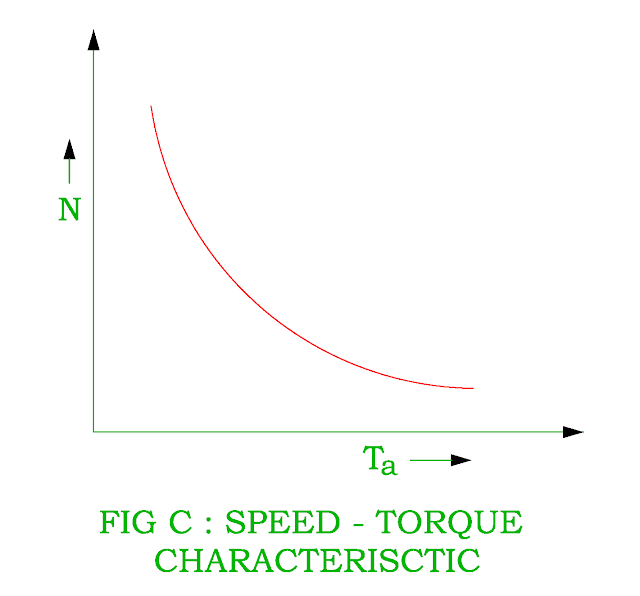 The shaft torque is always less than the gross torque because of stray losses. ( Why the DC Shunt motor never start against heavy load? ) It should be noted that the heavy starting load requires heavy starting current therefore the DC shunt motor never starts against heavy load. 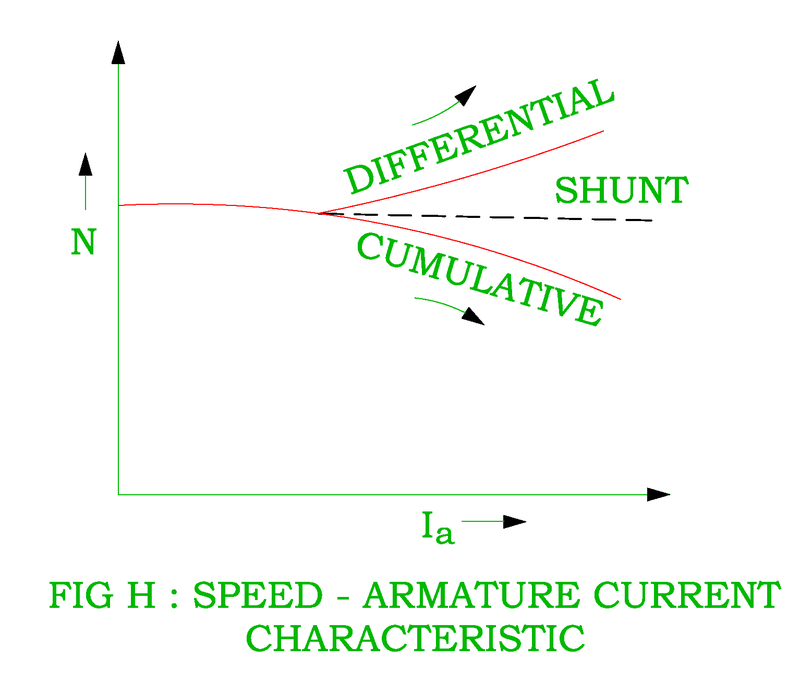 The shunt flux does not remain constant at any load condition but it decreases slight at heavy load due to effect of armature reaction. The speed is directly proportional to back emf and inversely proportional to flux. The back emf ( Eb = V – IaRa ) decreases with increase in load current. The back emf Eb decreases very small due to small armature resistance whatever the load condition. The flux also decreases with increase in load current due to demagnetizing effect of armature reaction. It is concluded that the back emf and flux decrease with increase in load but the back emf decreases slightly more than the flux. 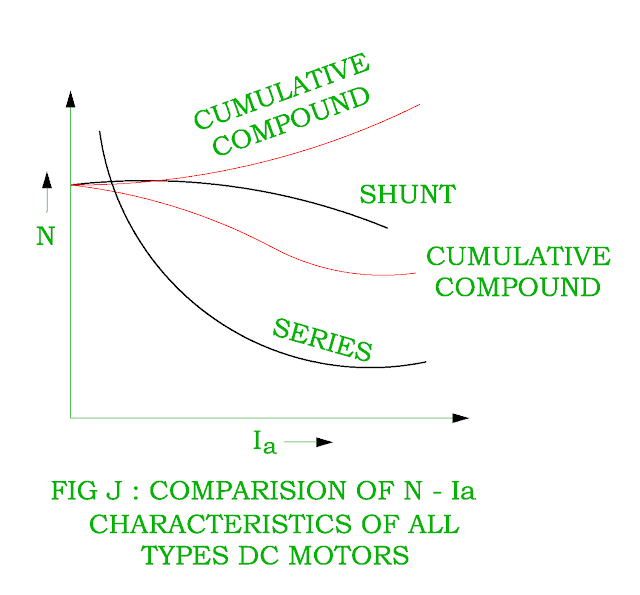 Therefore the DC shunt motor is practically constant speed motor. The DC shunt motor is useful for moderate speed control. The DC shunt motor is well suitable for lathes, machine tools, driving, shafting, milling machine, conveyors etc. The speed – torque characteristic is shown in the Figure F. Whatever the armature torque, the change in speed is negligible. The series flux is in the same direction as that of shunt flux therefore the net flux increases as the load current increases in the DC Cumulative compound motor. As the load current increases, the flux due to series field winding also increases result in greater torque obtained that of DC Shunt motor for same load current. 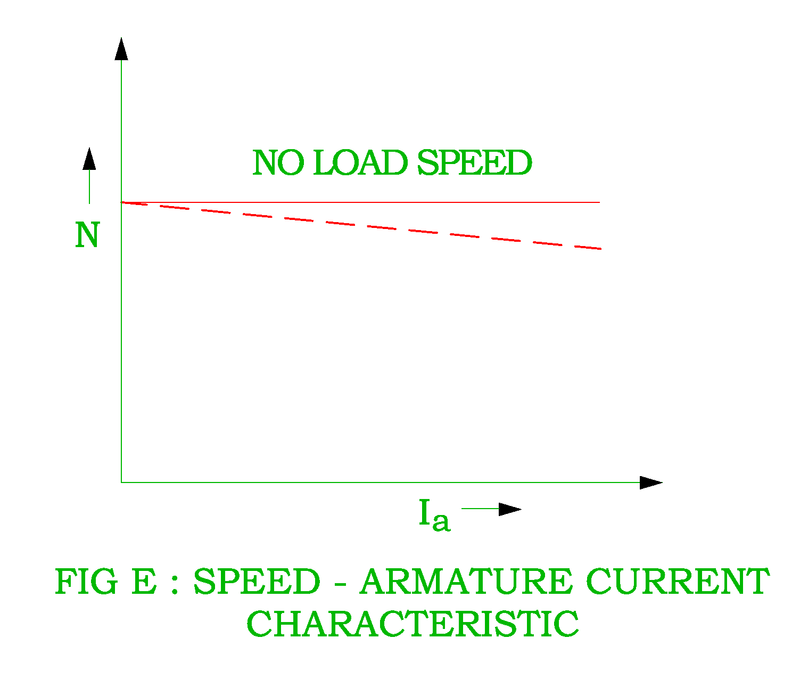 As the load current increases, the flux due to series field winding also increases. This will result in fall in speed which is more than that of DC Shunt motor for a given armature current. However the speed does not become dangerous high due to presence of shunt field winding flux. The series flux opposes the shunt flux in the DC Differential compound motor therefore the net flux decreases as the load current increases. The armature torque increases less than that of DC Shunt motor for a given armature current. As the series field flux opposes the shunt field flux, resultant flux decreases with increase in load current. The back emf decreases as the load current increases but it decrease slightly less than that of flux. 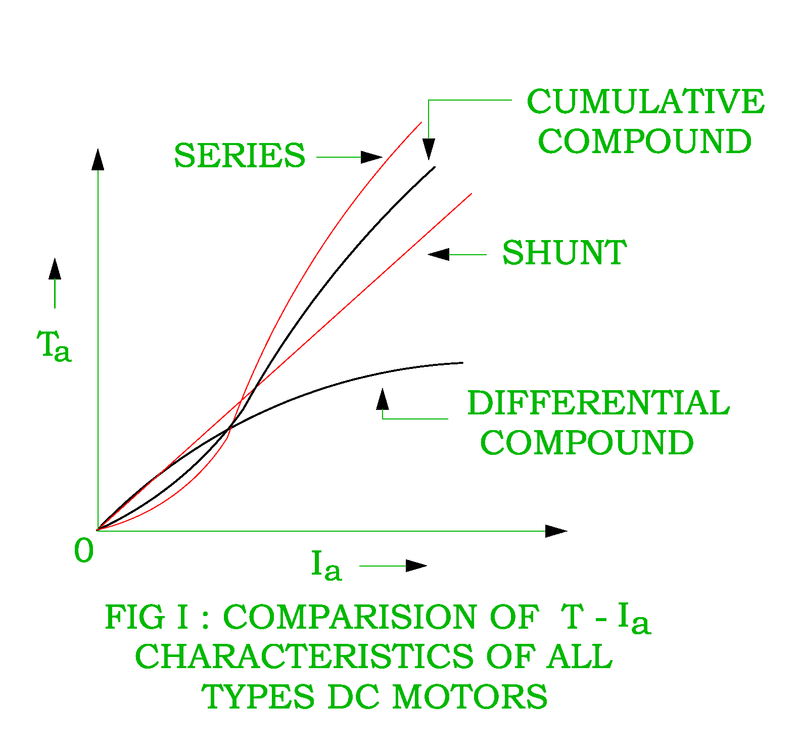 Therefore the speed of the DC Differential compound motor is slightly higher than the DC Shunt motor for a given armature current. The DC Differential compound motor is useful for constant speed application. It should be noted any suitable characteristic can be obtained by suitable designing of number of shunt field turns and / or number of series field turns in the DC compound motor.